With Godzilla: King of Monsters set to release next year, Legendary Comics has announced the “thrilling companion graphic novel” titled Godzilla: Aftershock which was written by Arvid Nelson, with art by Drew Edward Johnson. Godzilla: Aftershock continues the story of 2014’s Godzilla after the catastrophic events in San Francisco. 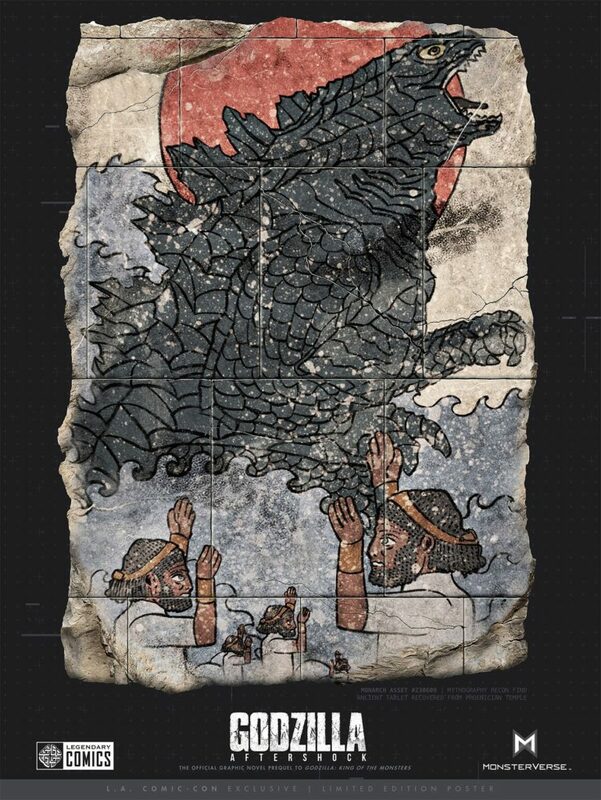 The King of the Monsters finds himself once again “threatened as a terrifying new foe rises from the depths of the earth, unleashing a series of devasting earthquakes and driven by an unstoppable primal instinct that will test Godzilla” in a manner he has never experienced before. Godzilla: Aftershock will be available online and in stores in Spring 2019. You can go ahead and follow the official Facebook page for more information and updates. “Godzilla: Aftershock is yet another exhilarating entry into the canon of the MonsterVerse, and it is especially exciting to introduce fans to a brand new original monster unique to the comic, but true to the legacy of Godzilla,” said Robert Napton, Senior Vice President of Legendary Comics. Introducing characters from the upcoming movie, the graphic novel also invites readers to delve further into the activities of cryptozoological agency Monarch. The brilliant and driven Monarch operative Dr. Emma Russell races to stop the threat as clues emerge to reveal a terrible secret—a tragedy, of apocalyptic proportions from the distant past that changed the course of human history, is returning to threaten it once more. A shadowy figure stalks Emma’s every move as she travels the globe to uncover secrets, while Godzilla clashes in an ancient rivalry as old as the earth itself. The fate of the world lies in the balance in an epic confrontation that no Godzilla fan will want to miss. In more exciting news, fans attending Los Angeles Comic Con are invited to get a sneak peek of Godzilla: Aftershock at the Legendary Comics panel “Godzilla: Secrets of the MonsterVerse” in Room 403B on Saturday, October 27 at 3 pm. The first 500 fans in attendance will receive “an exclusive signed/numbered Godzilla poster” only available at the panel. Visit the official website for more information. As for when you can see Godzilla on the big screen, Legendary Entertainment and Warner Bros. Pictures’ Godzilla: King of the Monsters will be released in theaters nationwide on May 31, 2019. Coming to the creators, writer Arvid Nelson has worked on several films before deciding to focus on graphic novels. Since then he’s written over a dozen titles, including two original series Rex Mundi and Zero Killer. He’s worked for DC Comics, Marvel Comics, and Dark Horse Comics. Do visit his website. Artist Drew Edward Johnson started drawing comic books in 1995 with Dark Horse Comics’/Lucasfilm’s Star Wars X-Wing: Rogue Squadron. His work has since been published by DC Comics, Marvel Comics, Top Cow, DDP, and Wildstorm. Are you excited about Godzilla: Aftershock? Let us know.